What are the causes of transient ischemic attack (TIA)? What are the risk factors for transient ischemic attack (TIA)? What are the symptoms of transient ischemic attack (TIA)? How is transient ischemic attack (TIA) diagnosed? What is the treatment for a transient ischemic attack (TIA)? What is the prognosis for transient ischemic attack (TIA)? A transient ischemic attack (TIA) is a brief interruption of blood flow to part of the brain that causes temporary stroke-like symptoms. The risks for TIA are the same as for heart attack, stroke, and peripheral artery disease, and include smoking, high blood pressure, high cholesterol, diabetes, and family history. 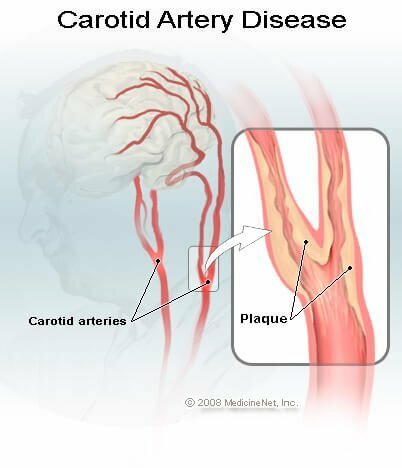 The artery blockage may occur because of a ruptured plaque due to atherosclerosis or hardening of the arteries, debris that floats downstream from narrowed carotid arteries or blood clots (emboli) that form (often in the heart) and travel to block an artery in the brain. Since TIAs resolve on their own, the goal for treatment is to minimize the risk of future TIAs and stroke. Treatment involves looking for the reason why the TIA occurred. Treatment may include aspirin or other anti-platelet medications like Aggrenox or clopidogrel (Plavix). It is important to educate the patient and family that should another stroke-like event occur, 911 must be called and emergency medical services activated, since there is no guarantee that symptoms will resolve. The primary role of the brain is to send signals to the body for motor function and respond to receive signals received through the five senses (sight, hearing, touch, smell, and taste). The brain processes information both through conscious thought, and unconsciously through the nervous systems that control basic bodily functions, like heart rate, breathing, and temperature control. The brain is arranged so that the right side of the brain controls the left side of the body, and the left side of the brain controls the right of the body. Vision is located in the back of the brain (occiput), and balance and coordination are located at the bottom of the brain (cerebellum). Blood supply to the brain comes from the two carotid arteries that are located in the front of the neck, and the two vertebral arteries that run in the back of the neck through small canals in the bony spine (vertebrae). All four arteries connect at a junction of blood vessels located in the base of the brain (called the Circle of Willis), and from there smaller arteries branch out to supply the brain with oxygen and nutrients. When a portion of the brain loses its blood supply, it can become damaged and stop functioning. When a portion of the brain does not function, the part of the body that it controls also stops working. This is called a stroke or a cerebrovascular accident (CVA). If the brain is able to regain its blood supply quickly, then the CVA symptoms may resolve; this is known as a transient ischemic attack (TIA). A TIA is a stroke that resolves by itself. Loss of blood supply to portions of the brain may occur for a variety of reasons. A blood vessel can become blocked, and blood supply to a part of the brain is lost, or a blood vessel can leak blood into the brain (brain hemorrhage). Most commonly however, the blood vessel is blocked. The blockage can be caused by a blood clot that forms in the blood vessel (thrombosis) or it can be caused by a clot or debris that floats downstream (embolus). Fatty plaque formation in the blood vessel wall is called atherosclerosis or "hardening of the arteries." Plaque can rupture and cause a small blood clot to form and occlude the blood vessel. Blockage can also occur when debris from narrowing of a carotid artery breaks off, and floats downstream to cause the occlusion. Sometimes, in people with an irregular heart beat called atrial fibrillation, small blood clots can be formed within the heart and travel to the brain to cause the obstruction. Brain hemorrhage or bleeding in the brain can be due to an aneurysm, a weak spot in a blood vessel that ruptures and spills blood into the brain tissue, or it may be due to spontaneous bleeding caused by poorly controlled hypertension (high blood pressure). Such bleeding more commonly results in the irreversible damage of a stroke, and would not necessarily resolve to be classified as a TIA. Moreover, any condition that results in stagnant blood flow and or clotting may result in a TIA due to embolization of a blood clot. Such conditions may include atrial fibrillation, large heart attacks, and severe weakness of the heart muscle (cardiomyopathy) . The intensity and location of the blood limitation to the brain will determine what symptoms will occur as a result of a stroke or TIA. Many people experience confusion, weakness, and lethargy. If the loss of blood supply is in an area supplied by the middle cerebral artery, a classic sign may include weakness or paralysis and numbness of one side of the body. The whole side may be affected, or just one limb. Often there is a facial droop. If the stroke is on the left side of the body where the speech centers are usually located, there may be difficulty understanding words or speaking. Partial vision loss may also be part of the constellation of symptoms. Strokes involving the vertebral arteries decrease blood supply to the base of the brain and may cause a drop attack (a sudden fall while walking or standing, and then a quick recovery), an unexpected collapse, incoordination, or difficulty walking. The important distinction between stroke and TIA is resolution of the symptoms. By definition, the symptoms of a TIA must completely resolve. And, while this most often occurs within the first few minutes after symptom onset, it may take up to 24 hours to have complete return to normal function. A special type of TIA is amaurosis fugax. Transient blindness in one eye occurs because debris from a narrowed carotid artery clogs the artery (ophthalmic artery) that supplies blood to the retina of the eye. Assess mental status to make certain the patient is alert and oriented. Check eye range of motion and facial movement to evaluate the cranial nerves (the short nerves that run from the brain to the face and neck). Listen to the neck with a stethoscope to detect abnormal sounds that may signal narrowing of the blood vessel (carotid bruits). Check for a regular heart rhythm to rule out the presence of atrial fibrillation. Examine the arms and legs for tone, power, and sensation. Some hospitals have CT angiogram available to evaluate the cerebral, carotid, and vertebral arteries. This test is the same as a CT of the head with the addition of intravenous dye into the blood vessels to the arteries. Routine blood tests may include a complete blood count (CBC) to assess for anemia (low red blood cell count) or too few platelets (thrombocytopenia). If the patient takes warfarin (Coumadin), a blood thinner, then an international normalized ratio (INR - a blood test that measures the degree of blood thinning) or prothrombin time (PT), may be performed to assess blood clotting measurements. If there is concern that the heart is the source of blood clot or debris, then an echocardiogram or sound wave tracing of the heart may be considered. Treatment for a transient ischemic attack is aimed at preventing a second stroke. Since there is no way of determining the severity of future episodes, and no guarantee that the symptoms will resolve, prevention of a future TIA or CVA is crucial. Treatment guidelines address a variety of targeted goals. If the patient was not taking aspirin when the TIA occurred, it usually is started at a dose of 325 mg per day. If the patient was taking aspirin, another antiplatelet drug called dipyridamole may be added. Aggrenox is a combination of aspirin and dipyridamole. Headache is often a side effect. If the patient cannot tolerate aspirin because of allergy or stomach upset clopidogrel (Plavix) may be used. Even if the patient does not have hypertension or high blood pressure, there may be benefit in taking anti-hypertensive medications. Two classes of drugs are recommended to be started at the same time, a diuretic and an ACE inhibitor. The goal for normal blood pressure is 120/80. Guidelines recommend that a statin drug be started, even if cholesterol levels are normal. Simvastatin (Zocor) is the most commonly recommended medication, but new guidelines limit the amount prescribed per day because of the risk of liver side effects. Smoking: Counseling, smoking cessation aids like nicotine gum or medications like varenicline (Chantix) should be considered. Environmental smoke should be avoided. Alcohol: Intake should be limited to two or fewer drinks a day for men and one or less for women. Obesity: Overweight people should try to lose weight using a combination of diet, exercise and counseling. The goal is a BMI of 18.5-24.9 and a waist line of 35 inches or less for women and 40 inches or less for men. Exercise: 30 minutes of moderate exercise daily is recommended for those who are able. For people with disabilities, a tailored exercise program to their capabilities should be arranged. A transient ischemic attack should be considered a major warning sign of an impending future stroke. Up to 15% of people will experience a stroke within three months of TIA. Since there is no way of predicting that stroke-like symptoms will resolve, the patient and family need to be educated should symptoms occur, they need to access medical care emergently activating the emergency medical services system and calling 911. If a stroke occurs, there is a very short period of time where the thrombolytic (clot busting drugs like alteplase [TPA]), can be used to reverse a stroke. In most hospitals, the drug can only be given within 4 1/2 hours of onset of stroke symptoms. In that time frame, the patient needs to get to the hospital, the diagnosis needs to be made, laboratory tests and head CT scans need to be performed, neurologic consultation needs to occur, and the drug administered. The longer the delay, greater the risk that the drug won't work and that complications such as bleeding into the brain will occur. Specialized interventional radiologists can inject TPA directly into the clot that has blocked the blood vessel in the brain. This can extend the time frame to six hours or longer, but currently this treatment is not widely available. TIAs should be considered the equivalent of angina of the brain. In heart disease, angina is the heart pain that warns of potential heart attack. When heart muscle is damaged, it cannot be replaced or repaired. Similarly, brain tissue is at risk when there is decreased blood supply and it, too, cannot be replaced. Furie KL, et al.Guidelines for the Prevention of Stroke in Patients With Stroke or Transient Ischemic Attack. Stroke. 2011;42: 227-276.